KAYAKING BIOLUMINESCENT BAY, SNORKELING CULEBRA ISLAND, BEACH EXPLORATION & SNORKELING BY MINI BOAT & HIKING EL YUNQUE RAINFOREST IN PUERTO RICO. We take you to Puerto Rico’s most enchanting aquatic reserves. WELCOME to Kayaking Puerto Rico! We are a group of young people in love with our island. We know Puerto Rico and we like to share it with the world! That’s why we offer the best selection of award-winning Puerto Rico tours. Discover Bioluminescence on our Bio Bay Fajardo Kayak tour. Pilot your own, zippy mini boat in our Mini Boat Beach and Snorkeling Adventure tour. And, for the ultimate Snorkeling Adventure, join us in our Culebra Island Aquafari Kayak and Snorkeling tour. If you want it all in one day check out our Bio Bay & Rainforest Combo tour. 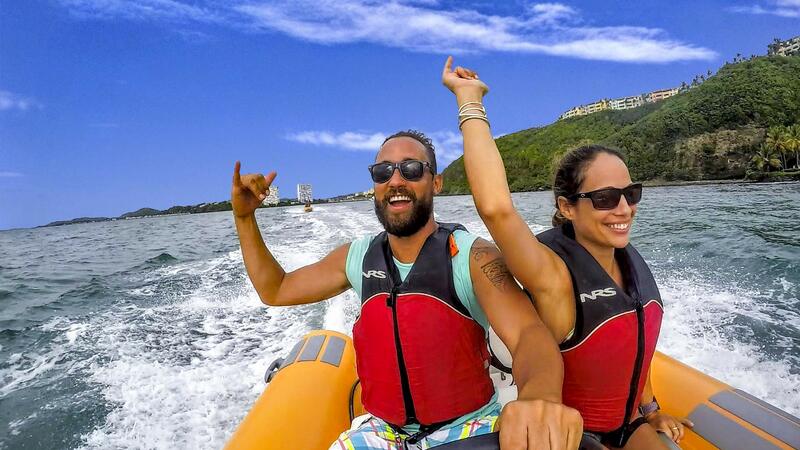 Let us take your Puerto Rico excursions to the next level! Discover the magic of bioluminescence! Puerto Rico is one of the few places on the planet where bioluminescence occurs. In the island, the best option to see it is in the Fajardo Bio Bay. First of all, it is close to the San Juan Metro Area. In fact, the driving distance is about 45 minutes. Plus, we have transportation options available! Also, our Bio Bay Tour is eco-conscious. Motor boats harm the Bio Bay environment. With us, you go on a kayak! Paddling through the Bio Bay lets you be in closer contact with nature. You can trigger, see and touch the glow yourself. But most of all, you will be going with the pioneers of the Bio Bay. Let us show you! Kayaking Puerto Rico takes you to the top attractions in our islands. For instance, check out our El Yunque & Bio Bay Tour. It combines the bioluminescent bay with a hike to El Yunque Rainforest. 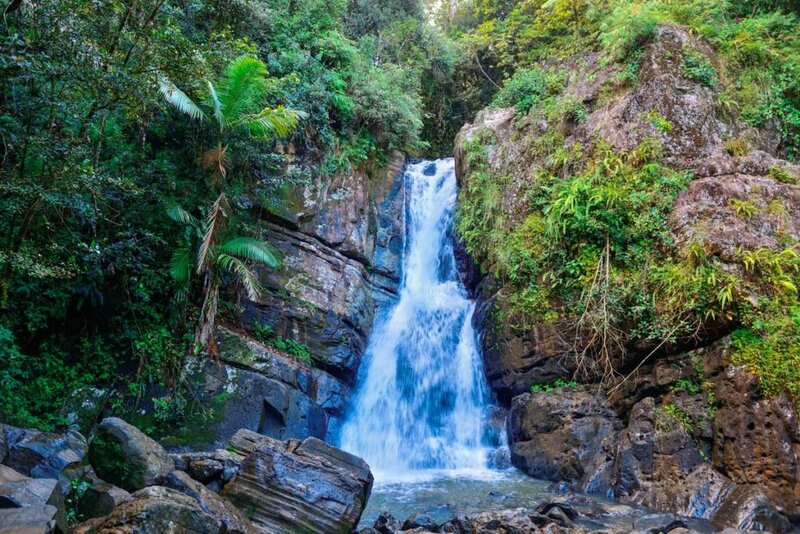 First, walk the trails and visit the waterfalls. Next, enjoy a Puerto Rican-style lunch. Finally, end your day at the bioluminescent bay. All with transportation included! Learn more. 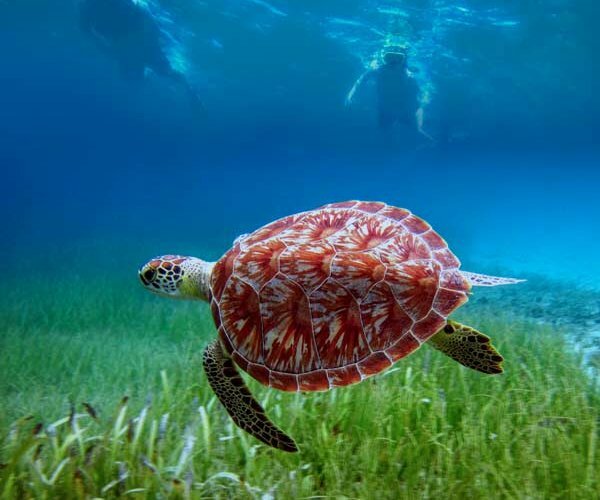 Go on a REAL snorkeling excursion! If you are in Puerto Rico, snorkeling must be on your list! But, don’t just grab a snorkel and go to some beach. Snorkeling in Puerto Rico is our specialty. 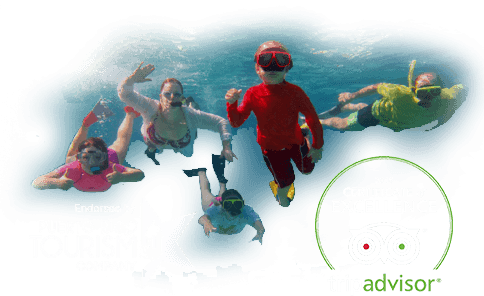 Let us show you how we do snorkeling in Puerto Rico! Kayaking Puerto Rico snorkeling tours are unique in the island. On our Mini Boats Adventure, you go snorkeling like never before! First, you go out riding your own mini speedboat. No captain’s license is required. Next, follow our convoy through a string of secluded cays. On each stop, find a perfect white sand beach to chill. Underwater, a colorful world awaits. You Mini Boat comes packed with snacks and refreshments. So just hop in, start the engine and go! Check it out! Looking for a stunning snorkeling adventure? Go snorkeling in style on our Motor Vessel, Innovation Snorkel & Beach Tour. Trip includes food, drinks, and all you need to travel in comfort. Learn more! 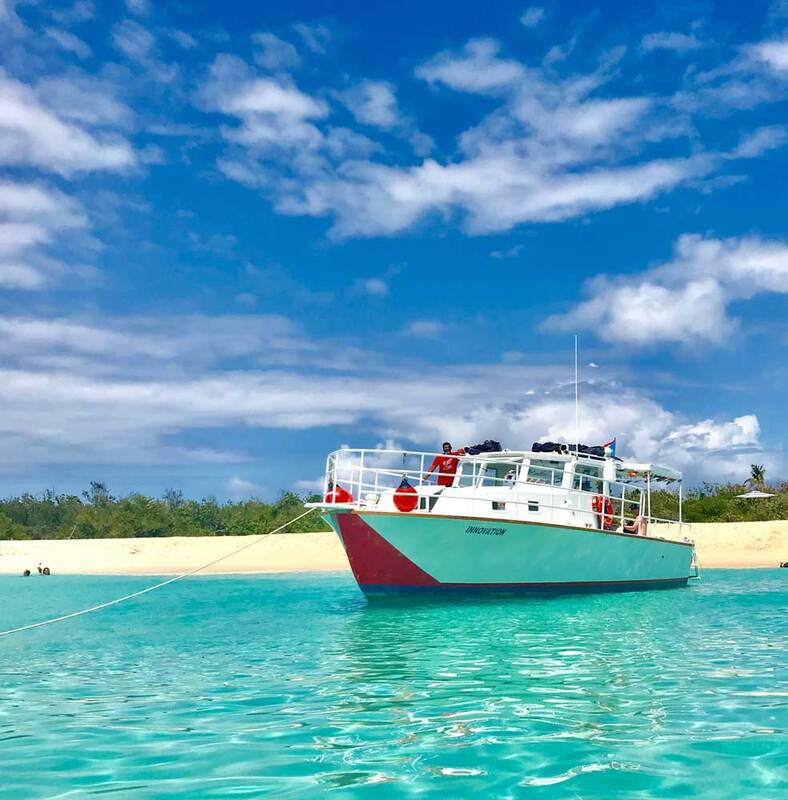 Join us on a Snorkel & Beach Safari aboard the motor vessel ‘Innovation’ as we cruise to the best snorkeling spots and beautiful beaches, on uninhabited Islands that Puerto Rico has to offer! Sway to the sound of island music as we navigate through clear blue water. Snorkel among vibrant marine ecosystems. Explore the secluded Icacos Island. Sunbathe and swim on a white sand beach. All while enjoying an unlimited buffet with guava coladas, soft drinks and rum drinks! Bring the kids for a beach and snorkeling experience they will never forget. Its an adventure whether you know how to kayak or not!! Knowledgeable staff from reservations to guides!!!! Recommended highly. Five stars!!!!! The staff was very friendly. The experience was enjoyable for the whole family. They worked with the children on board to help teach them about sailing and snorkeling. We have done many snorkeling tour in various places, this tour tops our list. Most “sailing” tours only go to the snorkeling site with the engine running. This tour sailed to and from the beach. We snorkeled at two places and had a two-hour stay on a great beach. Lunch was great and we had plenty to enjoy. I highly recommend Fun Cat Catamaran if you are in Puerto Rico. We have had a great trip to Puerto Rico and by far, the best thing we’ve done is spent a day on the Fun Cat Catamaran with Capt. Jim and his crew. They were all outstanding!!! The ship was beautiful. The equipment was top notch. The lunch buffet, snacks, and drinks were all delicious. The Pina Coladas were awesome!!! And all of the places we stopped were amazing. Do this tour – you will not be sorry!!! We had an awesome time at this tour, our guides Noel and Jamil were super friendly and knowledgable, we hope to come again and do it again soon! A+ to this company and all it’s staff! Everything was well organized and most importantly FUN! Our tour guides were awesome, friendly and knowledgeable. My kids (12,9) had a blast! Would definitely do it again. I took Lonely Planet’s suggestion of a surfing lesson from Brian and his crew at Surfing Puerto Rico. Such an amazing experience that now I’m hooked and looking for lessons back home in Maryland. Brian and his super professional and safe team helped me learn the ins-and-outs and get a bunch of stand-up rides. I’m 55 and had never surfed before. Would do it again in a minute! I went for the 3-hour surfing lesson101 and it was amazing for someone who has no idea about surfing whatsoever!! Brian was an amazing instructor overall!! Wanted to go for the 3 days lesson but didn’t have that time. I would definitely come back if I ever have that chance. Highly recommend it!